RemixOS is an Android flavor designed to bring the best PC experience to Android. Just a few days ago they finally released their developer edition for the PC based on Androidx86. What did you run this on? Okay, Okay. So what’s so cool about this? For this review, RemoxOS was run on a Lenovo T420with eight gigabytes of ram. The important thing to note here is that the T420 did not come with a USB 3.0 port. However, a USB 3.0 drive, the Mushkin Ventura Plus 64GB, was used. This means that the USB 2.0 port was likely running at maximum speed, but remix will probably still load quicker on a machine equipped with a USB 3.0 port. Why is this important? Most people who want to run android on a computer are probably going to want to do so on an old slow computer. 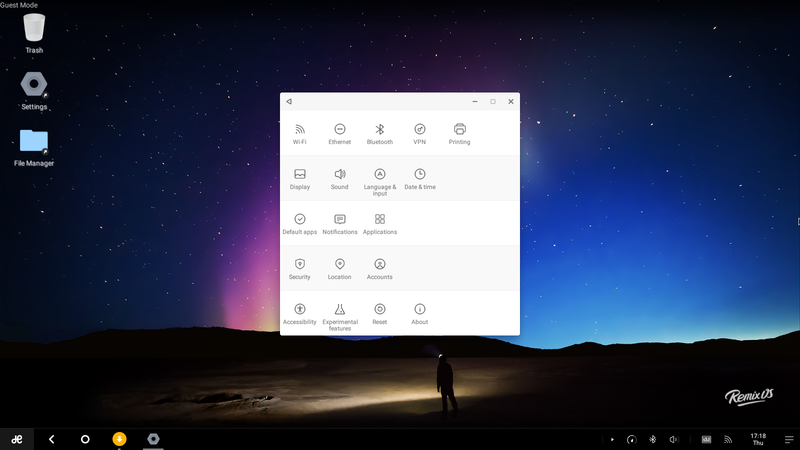 What does RemixOS state for a minimum requirement? USB 3.0. What do old computers typically have? USB 2.0 only. It only makes sense to give it a review on hardware people are likely to want to run it on. Who wants to run Android on newer $800 plus machines? Probably a few, but doubtful the majority. RemixOS runs directly from the USB stick. Once installed, simply try to boot the computer from the stick and two options should be shown. One option, guest mode, allows the system to boot in a mode that doesn’t allow any files to be saved. The other option, resident mode, boots into the system while allowing changes to be made to the stick. Unfortunately, this reviewer was unable to boot into resident mode and it will not be covered in this review. In spite of not meeting the minimum requirements, RemixOS still boots up in a reasonable time frame. Once loaded, however, it’s incredibly fast. Wifi and Bluetooth worked out of the box with no problems. Opening the browser and playing music via the Bluetooth speaker worked flawlessly. The “Print Screen” button worked for screenshots. Pressing it once brought up an adjustable screenshot box and pressing it twice expanded that box to full screen. Pretty nifty. Especially for this review! Turning off the speaker during a video , however, did not result in sound switching back to the laptop. Closing and reopening the browser fixed this issue. Perhaps the best part of the experiance was the simple feeling of, “Wow, this feels like a desktop” immeditly upon boot. Oh, and of course, as mentioned in a previous article. Being able to have multiple windows and move windows around brings it all together. Dragging windows to the side even resizes it into thirds. Brilliant! Okay, this isn’t huge, but when copying a file from one folder to another, if that folder already has a file of the same name, it simply automatically renames the copy. So, basically, the user does not have the option to overwrite files which could cause issues for some people. Other than the bluetooth speaker issue mentioned above, that’s about it for the bad. Time to move onto the next category. Their is no Play store. That’s a pretty big issue. The main draw to revitalizing that old computer with Android is to have access to the apps, other wise it’s just a browser. At that point, why not just use ChromeOS? APKs, of course, can still be installed. Heck, the Play store can probably even be installed. It’s unclear if RemixOS will ever ship with the Play store, but that would be crazy. RemixOS is currently targeting devlopers so this is understandable. When it’s actually released for the non-enthusiast/devloper it would not be supprising if the Play store shows up. For now, it’s probably not worth it to them to deal with the legal stuff. The other major problem was the installer. Linux users are suggested to use unetbootin to get it to work. It doesn’t, unetbootin rarely works, especially in Linux. 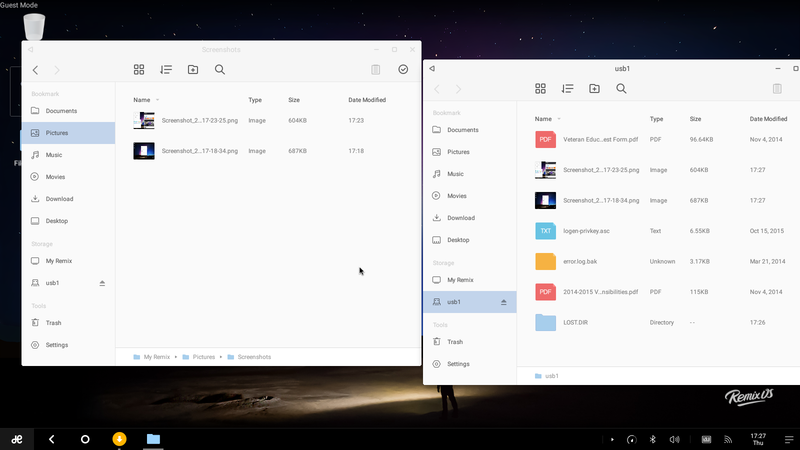 For Windows, however, RemixOS comes with an EXE file to help make the disk. Unfortunately, it seems to work in the same way as unetbootin. Step One: Format drive as FAT under Windows 8. Step Two: Run the installer and follow instructions. Result: Computer hangs while trying to boot the drive. Just a black screen once it starts running. The only way that worked was the good ole “dd” command in linux. WARNING: Do not do this unless you know exactly what you are doing. The device letter was changed to protect the innocent. Use which ever letter the USB disk is assigned, and pending on your system you may need to use “sudo”. Overall this was a truely amazing experiance. However, this is a developer edition, not for general consumer use. It wouldn’t be fair to heavly critisize the rough edges considering this is more of a functionality release. Not a user friendly release. The poor installer and installer suggestions are easy to forgive considering where they are at in devlopment. If this was a proper relase for general consumers, this would be absolutly unforgiveable. The lack of a Play store is another one of those things that’s okay for now, but it better be included later on down the road. Yes it’s possible to get around it, but for the general user it should be easy to install and have a store. If either one of those things are missing, the masses will never adopt it. And why should they? If someone didn’t know he could install apps without the Play store, what could he do with this? Look at it and browse some of the web. 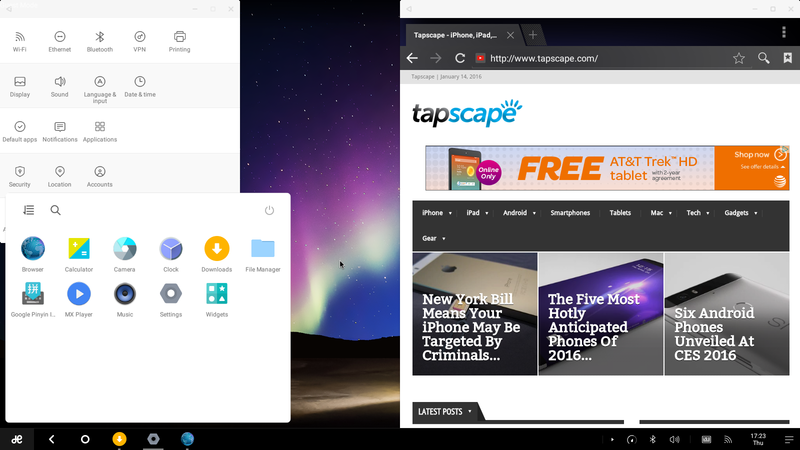 WIthout applications, it’s less useful then ChromeOS. At least that has extentions.